Switching and dimming light bulbs, HV halogen lamps, electronic transformers for halogen or LED lamps, dimmable inductive transformers for halogen or LED lamps, HV LED or compact fluorescent lamps. Switch-on brightness can be saved permanently. Switch on with the last brightness set, or a saved switch-on brightness. Minimum brightness can be set. 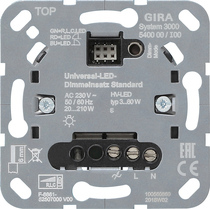 In general, operating the dimmer without connecting a neutral conductor is possible, although some LED and CFLi light sources require the neutral conductor connection to prevent flickering. Electronic transformers and ballast devices for LED lamps can be operated with the dimming procedure stated by the manufacturer.